The mountains are the most incredible part of Peru and the jungle is the least-known and biggest part of our country. During this 14-day tour, you will have the opportunity to see and explore these 2 diverse areas of the country. There are still pristine and wild places, see them while you have the chance. Puno - people visit Puno for Lake Titicaca, the world's highest navigable lake and home to the Uros people. The Uros people have lived on floating islands that they construct from reeds for generations, possibly as far back as Inca times and it is this unique culture that attracts people to the area. A boat ride on Lake Titicaca is an unforgettable experience, visiting the floating islands as well as the islands of Amantani and Taquile you see a side of Peru that is all but lost. The Amazon Rainforest - the jungle around Puerto Maldanado has been identified as one of the most biodiverse places on the planet. Staying in a lodge deep in the jungle you get to explore this fantastic environment by foot on jungle trails and by boat on the myriad of rivers and ox-bow lakes. Staying in a lodge is the perfect way to see the jungle allowing you to enjoy the wildlife in comfort. Day 2:Fly to Puno - free afternoon to acclimatise. Day 3:Visit the floating islands and Amantani Island on Lake Titicaca. Homestay with a local family. Day 4:Visit Taquile Island and return to Puno in the afternoon. Day 5:Travel to Cusco by tourist bus with visits to sites of interest throughout the day. Day 6:Free morning in Cusco to explore the city by yourself. City tour in the afternoon. Inca trail briefing in the evening. Day 11:Free day in Cusco to visit museums and local markets. Day 12:Fly to Puerto Maldanado (Amazon Jungle). 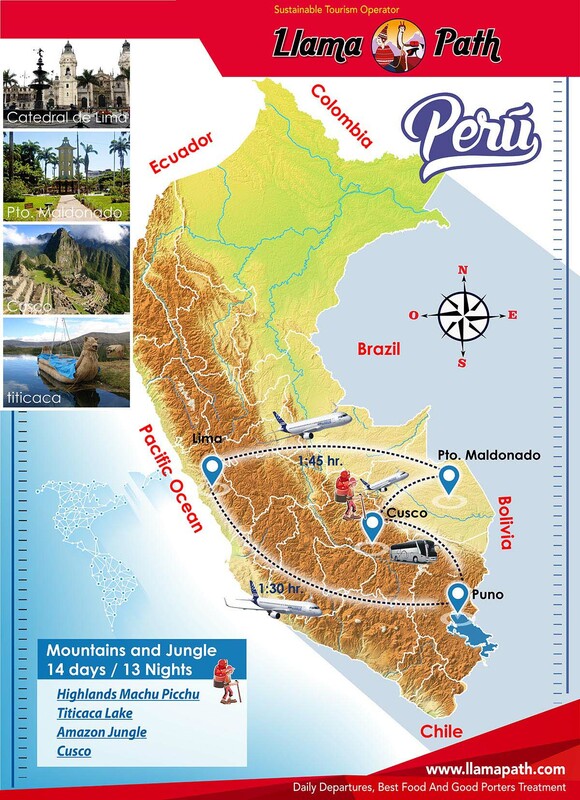 Day 14:Return to Puerto Maldando by river and fly to Lima.